(Benton Harbor, Mich.) If there was a moment that summed up the charm and the relaxed competition of the Champions for Change charity skins exhibition in Benton Harbor, MI, featuring Jack Nicklaus, Arnold Palmer, Tom Watson, and Johnny Miller, it occurred on the par-four third hole at Nicklaus’s newly opened Golf Club of Harbor Shores. After long stout drives that carried a cross bunker some 210 yards from the tee, Nicklaus and Watson bantered as they walked down the fairway. Nicklaus asked Watson from where he traveled to get to Benton Harbor, the depressed community in southwest Michigan whose hopes for economic development have surged with the opening of the 530-acre beach and resort community. Watson replied, “I came here from Kansas City; it was only a 90 minute flight.” With that as introduction, Nicklaus broke into quiet song, reciting lyrics of “Kansas City” from the venerable and popular stage play Oklahoma! As they strolled toward their drives, Nicklaus and Watson—holders of 26 major championships between them — exchanged slightly off-key verses of the song. They’ve gone about as fur as they c’n go! About as high as a buildin’ orta grow. What a picture: two longtime friends singing a Broadway ditty, relishing each other’s company while playing in an event that attracted a sell-out gallery of 3500 happy golf fans. That’s why you attend such an exhibition—to catch a more personal side to these legends, to bathe in their presence as the tide of time slowly takes them away. 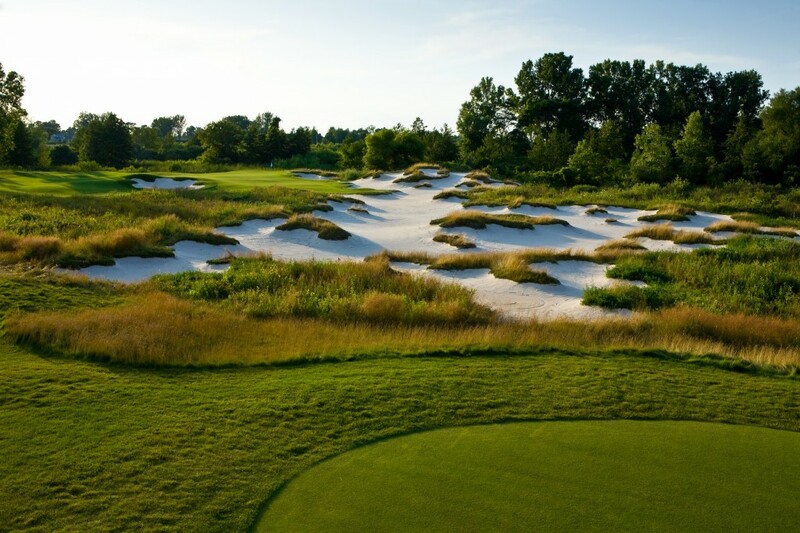 The Golf Club of Harbor Shores is noteworthy for how it reclaimed industrial wasteland and transformed it into a championship-caliber course already chosen (indicative of the Nicklaus clout) for the 2012 and 2014 PGA Senior Championship. It has a variety of looks as it meanders through woods, marshland, river and sand dunes along Lake Michigan. In keeping with his design tenets, Nicklaus affords space off the tee with ample fairways. The greens are generally large with lots of movement and slope in them; a few boast multiple tiers so accurate approach shots will be demanded. 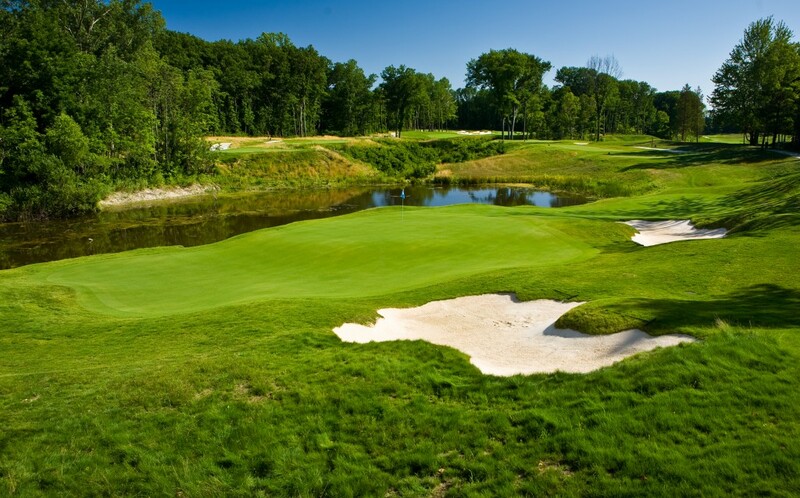 Surely the most popular holes will be those near and alongside scenic Lake Michigan. The par-four 7th hole heads due west toward the lake with the green nestled 25 ft atop a dune. Any short approach shot will roll to the bottom of the hill. For sheer beauty, the tee shot at the par-five 9th hole will take top honors. The tee is perched 60 ft above the fairway with marvelous views of Lake Michigan behind the player. The most controversial hole may be the par-five 10th. It sports a green measuring a gargantuan 10,500 square feet in size and with four different tiers. In the exhibition match, after being needled by Miller for the severity of the green, Nicklaus dropped an extra ball on the front of the green and aimed his putter at the flagstick some 100 feet away on the back tier. Amazingly, Nicklaus holed the putt to thunderous applause. It was the shot of the day even though it didn’t count. To the thousands of fans in attendance that didn’t matter a lick. They were just happy to be around these icons of the game lending optimism and goodwill to their ambitious community project now officially on the map.